The GT3/RS register members are known for their stoicism and asking them to be at Calder Raceway by 7:15 AM proved to be a major test of that stoicism. For those in the south eastern suburbs it meant a 5:30 AM start to the day. Having the Bolte Bridge closed for a fun run tested the register members time management and planning skills. A total of 14 people in eight cars passed the test with flying colours. Register Captain Greg Humphries demonstrated his leadership skills with a briefing in McDonald's on the planned route, waypoints, public conveniences, and, essential for this register, the need to be a role model for the club in sticking to the speed limit and providing courtesy to other road users. He announced that Robin Humphries was the official photographer for the day and I volunteered to write up the report. This was the first of three planned GT3/RS register events for 2019, this being the early morning run, to be followed by a lunch run and finally an early evening dinner run later in the year. Greg Humphries and Linley Baxter had done a test run of the route only two days prior and were confident that the run would be moderately challenging but very enjoyable. The best runs seem to be where the roads limit the top speed and test the handling of the cars ensuring everyone stays within the speed limit. Fellow GT3/RS register members, Allan and Kerry Hines, were the subject matter experts for the route. They knew and recommended some quiet, challenging, and fun roads within the Ballarat, Bendigo, and Melbourne triangle. The perfect weather meant these roads could be navigated well within the safety limits of our cars. The cars all proved to be more than up to the task. The Porsche marque was well represented with a 964 cabriolet (Vicki and David), Boxster S (new members Ian and Linda), Cayman (Dean), 991.1 GT3 RS (Neil), two 991.2 GT3's (David and Kathy; Linley and Helen), 996 4S (Greg and Robin), and a McLaren 650S (Chris and Bailey). Showing lots of confidence new members Ian and Linda led the way heading north on the Calder Freeway for a short distance before heading towards Diggers Rest then through Toolern Vale and Gisborne. From Gisborne it was on the back road to Mount Macedon with all the roads very quiet with the local residents enjoying an extra hour of sleep due to the end of daylight saving. The next stop was Lancefield and our rest break at Lancefield Park. A rest stop and a chance to chamois off the bugs from the first half of the run kept everyone busy. One young Porsche fan rode his bike over to inspect the cars and to compare them to his dad's Nissan Navarra. Car people are car people no matter what they drive. A future member of the Porsche Club of Victoria no doubt. The chilly morning encouraged us to make it a quick break and then we headed onto the Burke and Wills track with some twists and turns and ups and downs to challenge the drivers and their navigators. Hazards included motorbikes, cyclists and even a dog in the middle of the road at one point. I forgot to check whether the last driver through noticed whether the dog was still there after eight PCV cars had just missed him! I got the impression that eating dead rabbits off the road early in the morning was his normal ritual. We circled the outskirts of Kyneton and then taking the Kyneton-Metcalfe Road to Elphinstone then Taradale we arrived in Malmsbury a respectable 2.5 hour journey from the Calder Raceway. The Moto Bean Café were expecting us and provided great coffee and food for the hungry register members. With a few wrong turns taken by unnamed drivers there was plenty to chat about and, as usual, the fellowship proved to be equal to the driving enjoyment. A great day due to good organising, great weather, and roads perfect for any and all Porsches. Other registers are encouraged to repurpose this run even if not with a 7:30 AM kick-off! Change is a constant and a good thing. In trying to determine the style of event for December, the ‘brain’s trust’ of the GT3 Register were looking for something different away from the typical run timings and venue styles. What about an afternoon / dinner event to an outer suburban tourist destination? If that wasn’t risky enough, why not make it the day after the PCV Annual Ball! The following is a collection of observations and anecdotes from the day. Some 18 starters in 10 spectacular vehicles signed up, turned up and kept up during the afternoon / evening. Our inaugural evening outing was obviously so intriguing that it even enticed two long term Club members, Past President, Greg Cook (joined 1983) and Past Social Director, Michael Dennis (joined 1999) to make this their FIRST EVER Register run. Welcome all! We hoped that being on the roads much later in the day than usual would lead to reduced traffic and subjectively, that seemed to be the case. The first half on the run was the ‘twisty’ section, with three awesome short but undulating, narrow routes, Pigeon Bank Road, Alma Road and Clintons Road, testing out the cars & drivers steering and braking talents more than simple acceleration. And also testing, I should add, the passenger’s fortitude! Sunday drivers returning to Melbourne may have been wondering under what auspices the run was actually being conducted, when a stunning black McLaren 720S briefly slotted into middle of our Porsche GT3 convoy, by chance, right behind the Dennis's recently acquired Aston Martin V8 Vantage SP10. Incidentally, Michael's excuse for bringing that car along was to ask his new Aston 'the question' on the challenging roads chosen for this run, and I suspect the huge grin on his face at our Yarra Glen pit stop (and Kris’s ashen face) was a fair indication of the answer! At the rest stop in Yarra Glen, because of the time of day, in addition to the usual tea/coffee/water, a cleansing ale or glass of wine could also be, and in fact was, had. The second stage which took us across the Yarra Valley was at a more sprint pace towards Mt Dandenong and the SkyHigh Restaurant, our dinner destination. The public interest in our cars never ceases to amaze, with some young lads taking seemingly endless photographs at our Doncaster McDonald's meeting point and groups of overseas tourists pausing wide-eyed on their way to the viewing platform at the SkyHigh Restaurant with compliments and questions. We had a semi-private alcove area at the venue which encouraged lively conversation whilst consuming the standard SkyHigh entrée platters and various pub-style mains. Reflecting 'the partner-friendly vibe' of the register, one attendee happily commented that much of the conversation over dinner had absolutely nothing to do with cars! To top the evening off, several reports confirmed that descending the mountain in the dark following dinner was an additional bonus. With the snaking roads virtually clear of traffic and high beams able to be generously used, further excitement on the way home was guaranteed. Many thanks to Peta & Peter, Greg & Helen, Michael & Kris, Philippe & Wendy, Brendan & Catalina, Adrian, Michael & Judy, Tony, Linley & Helen and Robin for your contributions in making the run so enjoyable. To give due respect to any potential AFL premiership hangovers, at a slightly later time slot than normal, our eager drivers and passengers met at one of PCV’s ‘traditional’ starting points, the Hungry Jacks / Croydon Hotel carpark on Maroondah Highway, Croydon. Even though it was a slightly chilly morning, the group tended to congregate in the car park rather than inside potentially savouring the delights of the burger chain. One reason might have been that the run was an hour and forty five minute direct route to the luncheon venue in Yea and too much ‘breakfast’ might spoil the appetite. There may have been another reason and that could have been the sensational collection of cars that made up the 24 person, 13 car field. By my count, about 70% of the drivers were in GT3s, with three 996.1, one 997.1, two 991.1 and three 991.2. Of the 991 series, one was an RS and another a new Touring version. Lest other attendees should feel left out, not a bit of it. An S, a 4S and a Turbo comprised a ‘hat trick’ of the gorgeous 993 series, and the group was rounded out with a delightful Cayman S. Who would not want to stand around and look at that collection of cars and chat with the lucky owners, irrespective of the temperature! With the briefing out of the way we departed on time. The first few minutes of the run required a couple of turns controlled by traffic lights that naturally spread the group out. Our journey progressed through the back blocks of Wonga Park and I wasn’t sure if it was from the recent rains, but many of those houses looked a lot bigger than when I last saw them! We made good progress from Yarra Glen to Healesville towards the Chum Creek Road. The drivers enjoyed that famous piece of road in favourable conditions on the way to the Melba Highway for a short ‘transport’ stage before turning off on to the Break-o-Day Road towards Flowerdale. This piece of tarmac was new to me but should be on everyone’s drive list as the flowing route is a delight to drive and provides splendid vistas for the passenger. A quick left / right put us on to the Flowerdale / Broadford Road, another open flowing road that included a pretty impressive vertical escarpment towards the Broadford end. One element of our overall route was the number of ‘Turn Here for Yea’ signs we passed going apparently the wrong way! This was confirmed by one of our group who were coming from a different starting location to meet us for lunch passing us going the ‘wrong way to Yea’ on this stretch. The final stage from Broadford to Yea was a pleasant tour observing the bike riders enjoying the rail trails while travelling in convoy with similar paced vehicles. Our destination, the Peppercorn Hotel in Yea, is a delightful ‘old world’ pub with plenty of atmosphere and a deserved reputation for great food and interesting local wines. Considering that the venue was completely booked out on the day, for our largish group, the kitchen and service team did a great job in preparing and delivering our meals in a most acceptable timeframe. Judging by the ‘clean’ plates that were returned for both courses, the food was very well received indeed. And, as always, the table conversation was lively. Many thanks to all that came along and lent their fellowship and love of the Porsche marque to ensure a most enjoyable day. Perfect Melbourne weather heralded the prospect of one of the best GT3/RS/Register runs in the Club's history and as the cars started to arrive that forecast was quickly confirmed. First to arrive was Linley and Helen Baxter's 996 GT3 Mk.1, then a couple of 991 GT3 RS's arrived, followed by David and Kathy Danziger's 997 GT3 RS 4.0, and the stage was set. The rest of the pack included a McLaren 650S, 996 Turbo cabriolet, several 997 GT3's, and a couple of 996 GT3 Mk. 2's. Linley Baxter, filling in for Register Captain Greg Humphries, did a perfect run briefing reinforcing the need to drive responsibly, and then the cars briskly headed east from the Mulgrave McDonalds towards Lysterfield searching for the morning team venue in Gembrook. The Sunday morning traffic was light but traffic lights split the group into two. The rural setting of the Dandenong's was the perfect backdrop for effectively warming up the cars (and drivers) and there were enough twists and turns to keep the navigators on their toes as well. Gembrook was already busy when we arrived, but the spirited driving in our first stage was demanding enough for everyone to need a break. New members were welcomed, the specifications of the various cars compared, and the coffee and cake sampled. The second stage, the run to Toolangi, took us through Cockatoo and skirted past Woori Yallock, Healesville and Yarra Glen, familiar roads to most register run attendees. Being Sunday and a beautiful day meant keeping our eyes open for speed cameras, and sure enough there were three cameras along the way. Most of the run is in the twisty sections of the Dandenongs where, even with an 80 km/hr limit, even our quick drivers like Tony Stephens in his 991 GT3 RS would be hard pressed to exceed the limit. The perfect run to test these Porsche GT cars. Just as we hit the famed Myer Creek Road the Toolangi Tavern appeared on our left. 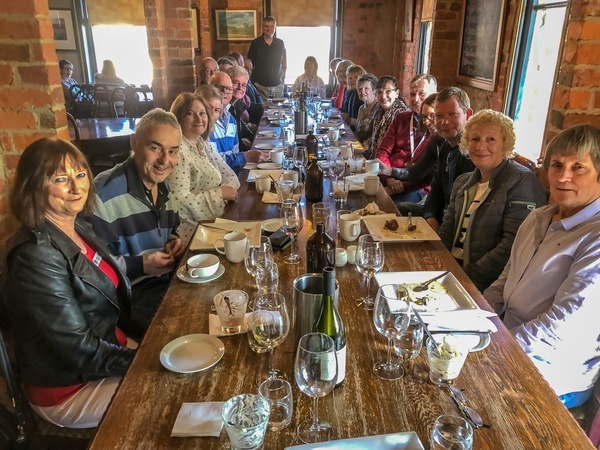 The perfect venue, shared between three car clubs, the Tavern staff provided a great two course lunch at just the right pace allowing our 20 attendees time to chat and share their relevant Porsche experiences. The debrief confirmed no-one had been caught by the speed cameras, that everyone had enjoyed the drive, no technical issues occurred with the cars, and everyone was looking forward to the next run. Thanks to Greg Humphries for setting the run vision, Ken Anson the Registers Director for his help with the run notes and Linley Baxter for coordinating the run day. With great weather, a large crowd, challenging roads, and an ideal venue for morning tea in Drouin, the GT3/RS/RSR run was destined to be a success. The flat-top truck back up plan for any break downs was not required but the ever-reliable multi-purpose race tape applied skillfully by Tony Stephens resolved an issue of a loose tail-light for one of the 28 Porsches on the run. The mix of cars was a testament to the diversity of the Porsche Club as a whole, with cars such as a 991 GT3 RS, 991 GT3, 997 Turbo, 993 Turbo, 993RS, 981 Boxter GTS, and 997 Targa generating some interest in spectators and drivers alike as we left McDonalds Mulgrave on time. The camera of Julie Mason was put to good use as can be seen in the accompanying photographs. The 16 solo drivers (no navigator) transferred responsibility for route adherence onto the cars with navigators as two separate groups headed from Mulgrave along Wellington Road towards the Dandenong Ranges. The roads were damp in places and the bright morning sun created a need for caution but also some amazing photo opportunities as the sun rays were emphasised in the light fog amongst the canopies of the trees. The run route took us through Emerald, Macclesfield, Yarra Junction and Powelltown as we headed to Nayook. The driver briefing warned of speed cameras and sure enough a mobile camera around the half-way point of the run required a sharp eye and emergency braking for many. As we turned towards Drouin the tight windy roads turned to high speed sweepers which opened up the groups. Our route to Drouin was Neerim, Nerim South, Rokeby and Drouin West. About 20 km’s from Drouin we passed a group of around 15 Mini Coopers heading away from Drouin on their club run. The end of the run was at the popular breakfast spot in the main street of Drouin, Middels, and Manager Brad Allan was very accommodating in providing their function room for our group. It was a nice touch that we could park a couple of RS’s right at the front door of our room to create a true Porsche atmosphere. Comments on why this run was so popular supported the strategy of a shorter run which didn’t require a full day commitment. The run was less than two hours in duration and some groups were still chatting and enjoying the Middels hospitality two hours after arrival. The blend of long-term and new members meant there were plenty of Porsches stories to share. Thanks to the GT3/RS/RSR Register Captain Greg Humphries for his help in checking out the run notes and organisation on the day. At the civilised time of 9.00am on Sunday the 23rd April the mighty GT3’s embarked on another fabulous run. The run was designed to excite the driver and delight passengers. We were over subscribed but some quick calls to the lunch venue had that sorted. Traversing the back of the Dandenongs the traffic thins and the roads opened out across rolling hills heading North towards the Yarra Valley. In this beautiful region we found a smorgasbord of open undulating roads finishing with a tight fun section just North of Healesville before our morning tea stop at the famous Tarra Warra Estate. Here there was time for art lovers to enjoy the wonderful exhibition by Louise Herman or simply to sip coffee under the peppercorn trees while appreciating the inspiring architecture. Another short but scenic drive on mostly traffic free roads took us to the lunch stop at Wild Cattle Creek Estate near Seville. A total distance of about 130 km had us driving for about 2 hours and 15 minutes (not including a 45 minute break at Tarra Warra). Amongst our crew were a number of hardy souls braving the event solo. Unfazed they simply followed cars that were 2 up and therefore navigation enabled. So we learnt that attendance on register runs is not the exclusive preserve of couples. We were also surprised and just a little concerned when the good folk from the Highway Patrol showed up at the start. They were good humoured, admiring the cars and generally extending good will. They took the opportunity to tell us that since it was a long weekend that the highway patrol was out in force. Not that we needed to be concerned because all participants heeded our Presidents recent call to run these events strictly within the law. There were no reported incidents. All in all I think those who attended enjoyed the run. Register captains and organisers do go to some lengths to ensure that their runs go off as smoothly as possible. Various contingencies are planned for, in the hope that everyone will enjoy the day however, the one thing the organiser can do little about, is the weather. The days leading up to our run to Kyneton were borderline abysmal, and the forecast for Sunday was just as miserable. Oh well, I did my best good weather dance. Lo and behold, the day dawned relatively clear and stayed that way throughout the day. It must be said that it was cold, like bitterly cold, with drivers and passengers almost needing to be bribed to get out of their cars for a photo op at Wallan! We lost a couple of cars before the start, maybe victims of the forecast but some 16 hardy souls in 9 cars departed Croydon. Congratulations to Rowan Thomson, Steve Porter, Chris Mason and Linley Baxter for actually bringing a GT3 to the GT3/RS/RSR Register event, comprising 44% of the entry list. Must almost be some kind of record for the Register! If only the Captain could get his act together and produce his. Our route took us through Yarra Glen, Christmas Hills and across the northern plains towards Wallan for a comfort stop and photo opportunity. There were some challenging navigation components in this first section but drivers and navigators coped superbly. There was also a pretty simple right turn onto a national freeway on-ramp that seem to tax a couple of the brightest in-car minds (not sure why you would turn south to go north but…). The highlight of the drive for me is the bridge across the Campaspe River just short of Redesdale. A beautiful old stone & steel structure, the likes of which you can be sure will never be made again. One tricky ‘non-turn’ in the main street of Kyneton caught out a couple of cars but generally all arrived on time at our luncheon destination, the Albion Hotel. I was expecting us to be seated downstairs in the hotel dining room, but instead we had a private room upstairs with our own dedicated serving staff. After some initial wrangling of the heater, we were comfortably seated and the noise level increased as the conversation fired up, assisted I suspect, by some local wines and other assorted beverages. Our meal started with some dips, followed by hearty mains and tasty desserts. I took note of the state of the plates as they were returned to the kitchen and I was thinking of asking for a refund on the washing up as most were very, very clean indeed! After helping ourselves to tea and coffee the group began to scatter, some to the bespoke and eclectic stores in Kyneton, others to nearby locales and the rest taking to easy freeway run back to the city. Many thanks to Dennis & Margaret, Ken & Harriet, Linley & Helen, Chris & Julie, Steve, Leigh & Dianne, Tony and Rowan & Nella for joining Robin and I in making the day a success. Due to a packed PCV calendar and a couple of scheduling conflicts, the GT3/RS/RSR and Turbo Registers got together to share a brunch run in mid October. Schatzi's Restaurant in Woodend was the chosen destination. Some 18 attendees in 12 cars arrived on a cool and overcast Sunday morning at the Rockbank meeting point for a prompt 8AM departure. It was great to see a couple of new faces joining in and a familiar face with yet another 911 Turbo recently added to his stable. Gorgeous spring sunshine greeted us as we made our way to the venue. Once seated inside, the food started to flow. And flow and flow… Our host Frank warned us to bring our appetites but at a relatively modest cost I wasn't sure how much fare could be provided. Platters of mini egg & bacon rolls, potato rosti, bratwurst pastry pin wheels, roasted tomatoes, steamed spinach, mini filo quiche cups, sautéed mushrooms, apple cake, juice and tea & coffee were enjoyed by all. After the food, some folks took the opportunity to get back to the city to resume their day, while a number of others stayed on chatting in street, admiring the cars and enjoying the spring sunshine. Thank you to Julie Mason for the photos and to Robin Humphries for putting the maps and run instructions together. And finally thanks to everyone for joining in and making this brunch run a most enjoyable morning.